This time the IronPig’s pitching completely dominated Bulls hitters. Not their worst of the year — that would be the three-hit outing over at Charlotte on April 25 — but close. And Mikie Mahtook got three of the 4 hits. Curt Casali got the other. The result was the Bulls’ third shutout of the year. Matt Andriese, the pitcher we like a lot, kept the ‘Pigs scoreless, but Braulio Lara had an awful ⅓ of an inning in which the Lehigh Valley folks got all their runs. Mr. Lara begins to worry me. He’s been with the Bulls for just a couple of weeks (first appearance May 10), but does not seem to be very effective, yet. Who are those guys? They two of WDBB's favorite players from 2013. Loved watching both of them play the game. Thought I'd pull up this picture. This is the running ERA of the relievers and starters. 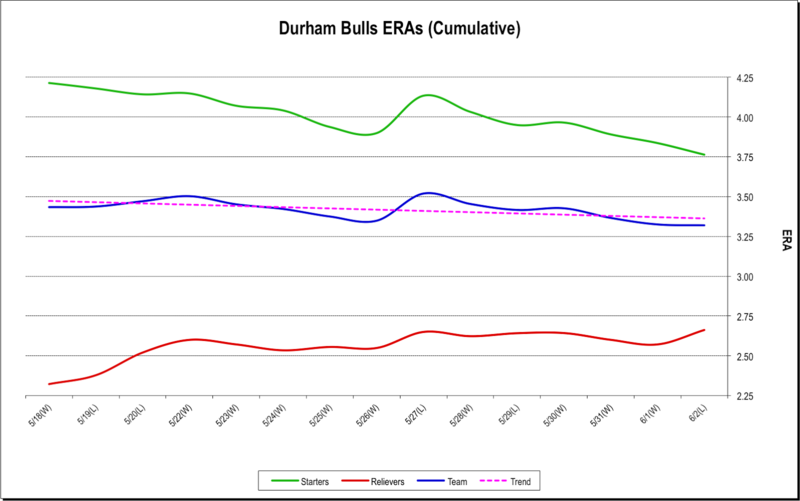 The Bulls went 10-5 over the 15 games shown (3 rotations), so it looks like the starting crew is steadily improving. Relievers are doing just fine, just not as great as they were. The Pawtucket Red Sox come to town today. They are one of the traditional powers in the International League (the Bulls played them for the championship last year). So far, they have not found their stride. They are last in the IL North, 3-7 in their last 10, and just dropped three games over in Norfolk. On the other hand, being last in the IL North does not mean you're out of the race. Those six teams are only a few games apart from top to bottom. [standings] PawSox infielder veteran Ryan Roberts spent some time with the Bulls last year. He was essentially an infielder-in-waiting for the Rays and did not add much value in his 37 games with the Bulls.